Starlite Printer Far East awarded with WorldStar Award, AsiaStar and Singapore Star Award! 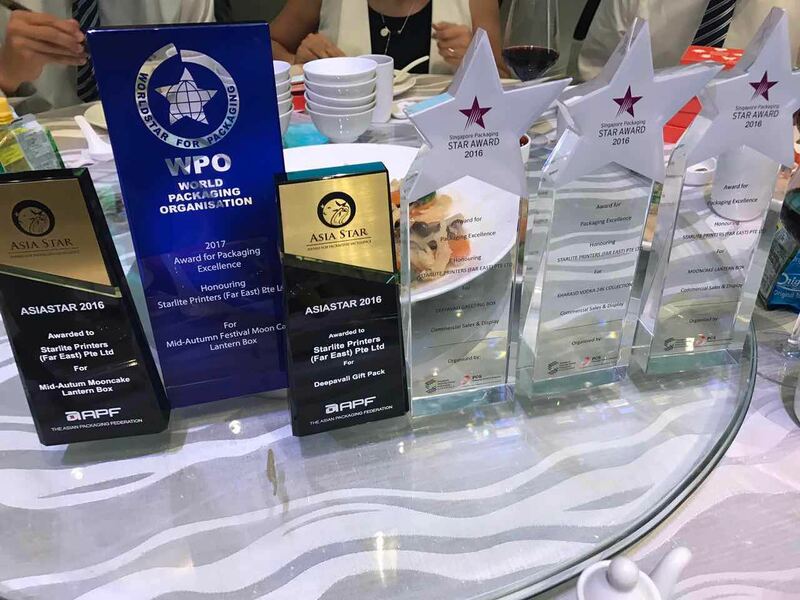 We are very pleased to announce that Starlite Printers (Far East) Pte Ltd has won the award of Singapore Packaging Star Award, AsiaStar Award and WorldStar Award! The Singapore Packaging Star Award is an annual flagship event organised by Packaging Council of Singapore (PCS), an industry group under Singapore Manufacturing Federation. This year the award gala dinner was held on 25 August 2017 at Park Royal Hotel on Beach Road and we are honoured to receive the awards from the Guest of Honour Dr Amy Khor, Senior Minister of State, Ministry of the Environment and Water Resources, Ministry of Health. We will continue to pursue excellence in packaging, and strive for bringing more innovative designs to our customers.